Unfortunately, BitTorrent has gotten a bad rap with its role in piracy several times before, but that doesn't mean there aren't plenty of legal uses for it. I personally use it to quickly download large Linux disc images that are a few gigs a piece, while indie artists use the protocol to get their content out to thousands of people without the costs of hosting it themselves. Today, I'll show you how to setup and use BitTorrent on your Nexus 7 tablet, then manage your torrents downloading on your computer straight from your tablet. Let's jump right in and get started! 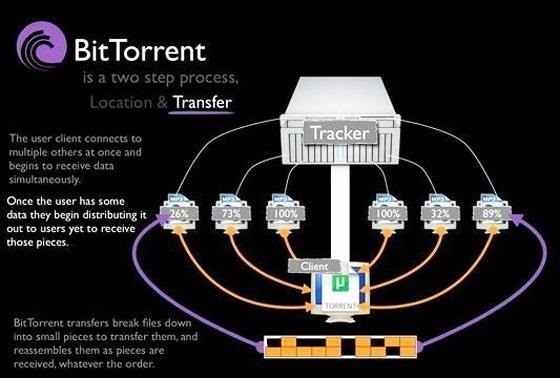 BitTorrent is peer-to-peer (P2P) file sharing. While I may be downloading a file from a torrent, I'm also simultaneously uploading the file to another user. Everyone is doing this constantly for every bit that's transferred, with the goal being to get the file to everyone as quickly and efficiently as possible. Torrent: File or link used to connect to the file; large torrent index sites host these. Magnet link: Works the same way as a torrent, except no torrent file needs to be downloaded. Client: A program used to download files from torrents; both client and program can be used interchangeably. Tracker: A server that manages users' connections. Seeders: Users who are actively uploading. Leechers: Users who are actively downloading; sometimes used to describe users who only download and not upload (like a leech). There are only one or two good BitTorrent clients for Android. I recommend uTorrent Beta (pronounced mew-torrent) as it's the most widely used both on Android and on desktop computers (for both PC + Mac). Its quick and easy setup makes this a favorite among users. Go ahead and download and install uTorrent Beta from Google Play on your Nexus 7. Using uTorrent Beta on Android is a breeze. Just find a torrent for a file you want to download and have uTorrent launch when prompted. Choose a download location. By default, files go into the Android Download folder. The UI is self-explanatory. Buttons for pause, add a new torrent, and closing uTorrent are at the upper right. Below are buttons for viewing your active torrents, searching for torrents on the web, featured torrents, and settings. For most users, the default settings in the app don't need to be changed. 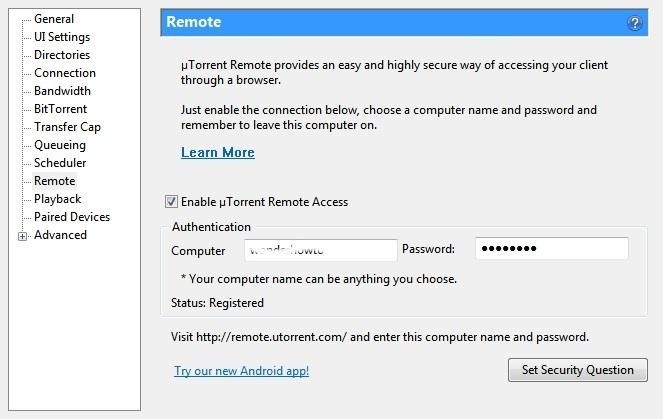 Begin by enabling remote functionality in the uTorrent desktop program settings by checking the box for "Enable uTorrent Remote Access". This will be the same for both Windows and Mac. Give your computer a name and a secure password. Now, head back to your Nexus 7 tablet and download uTorrent Remote. This app will act as a remote to the uTorrent desktop program on your computer. 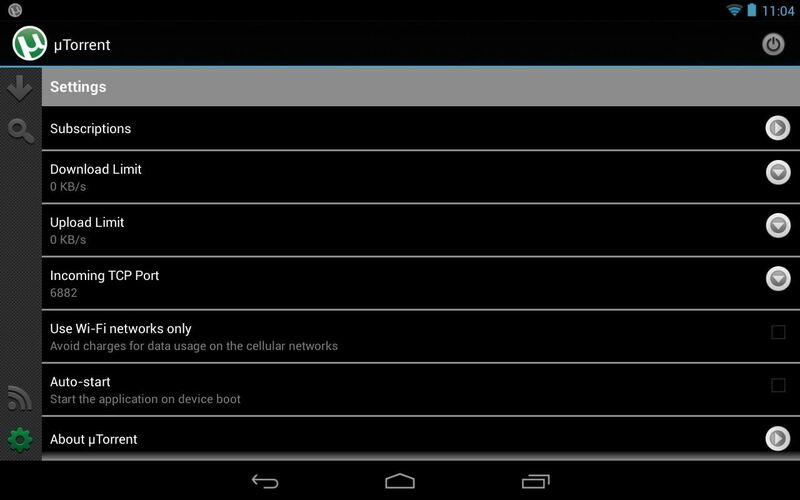 Now, whenever you have a torrent running on your computer, you can start, stop, or delete the torrent from wherever you are right from your Nexus 7 tablet. No need to hop on your computer! BitTorrent is a great way to grab large files off the web. It was made for this. As long as you have seeders uploading the file, downloads will be quick and painless. Users who are not familiar to torrents may have a slow time adjusting to how the downloads work, but it's well worth it! Be sure to use BitTorrent for legal purposes. I in no way endorse piracy. Thanks and start downloading in a new way! Great tip, but the free version is speed capped at 250kB/s and getting the pro version would cost a few bucks. It would ruin the benefits of torrenting. When I press the "Add" Torrent, I get a "fail to download" message. Any idea why? Thanks. I have the same problem with my Nexus 5. Cannot add torrent into uTorrent. It does not recognize the torrent file.. I can only download torrent file to my phone, but cannot open it. Any ideas how to solve this? My ISP has somehow blocked utorrent downloads on the Nexus 7 whereas the very same torrent downloaded in minutes on Nexus 4 cellphone. They are both configured exactly the same I.e. using port 8080 etc. Any explanation?